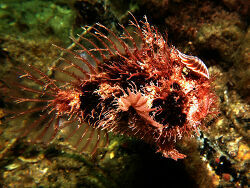 The family consists of 12 genera and 44 species. 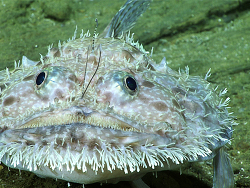 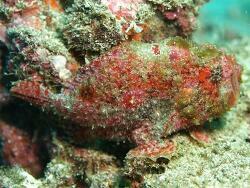 They are typically found upon rocky outcrops or large rocks at any depth, and most of them are small and rarely seen. 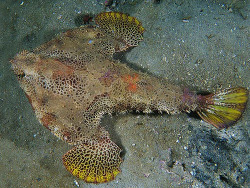 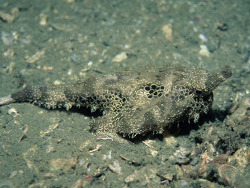 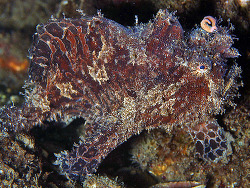 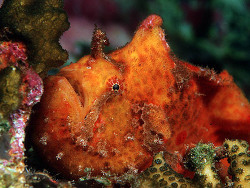 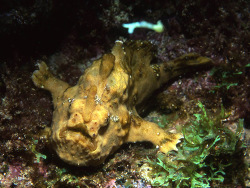 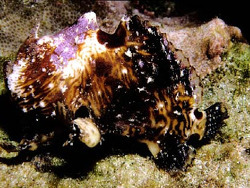 Frogfishes are also known as Anglerfishes since they use a modified dorsal spine having a tiny flap of skin at its tip as a lure to attract prey. 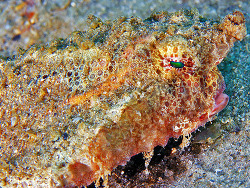 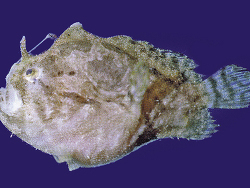 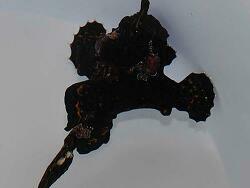 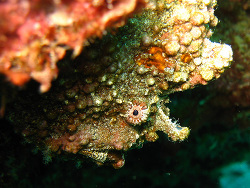 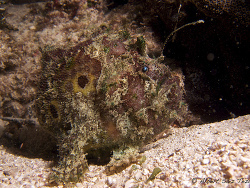 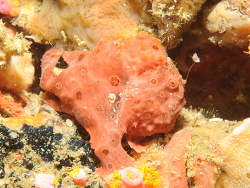 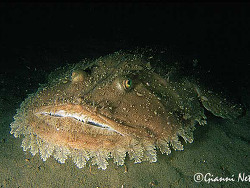 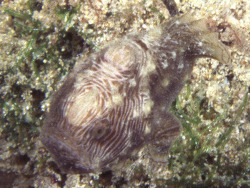 This lure is dangled, flicked and moved around in front of the Frogfish's head. 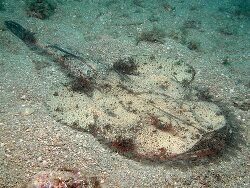 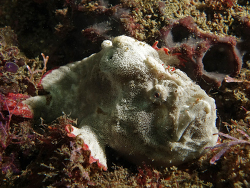 If a fish wants to catch this make-believe prey it becomes prey itself - fast as lightning the Frogfish greatly expands its oral cavity thus creating suction pressure inside the mouth and engulfs the animal. 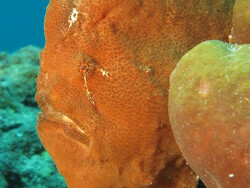 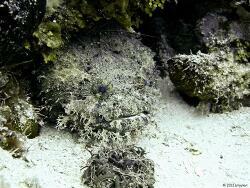 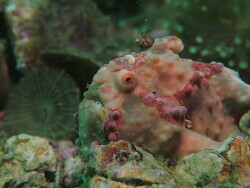 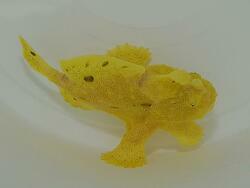 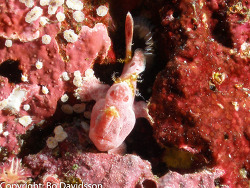 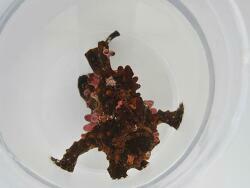 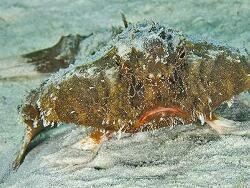 With this kind of luring behavior the frogfish is a very succesfull predator. 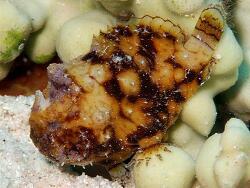 Despite their rather sedentary nature, all are voracious carnivores that wait patiently for smaller fishes or crustaceans to pass by. 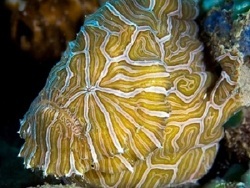 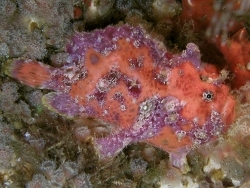 Color and color pattern of the Frogfishes is highly variable, with two extremes, the entire range of which can be assumed by living individuals of many species during a period of days or weeks, the specimens often changing radically upon preservation; a more common light-color phase with light-tan to yellow, orange, light-brown, or rust background often overlaid with black, brown, pink, or bright-yellow streaks, bars, and/or spots o the head, body, and fins; and a dark-color phase with green, dark-red, dark-brown, to black background with streaks, bars, and/or spots often showing through as deeper black, tips of rays of paired fins often white. 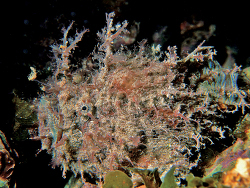 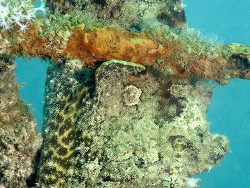 Juveniles and adults benthic in 0-300 m, with the single exception of Histrio, which is pelagic in floating sargassum weed; adults of some species attaining a standard length of at least 35 cm. 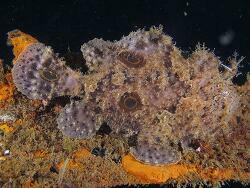 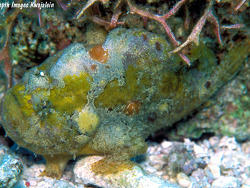 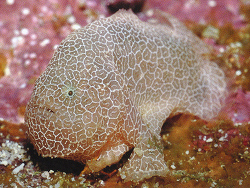 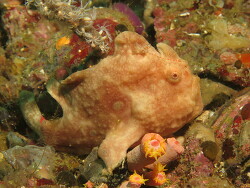 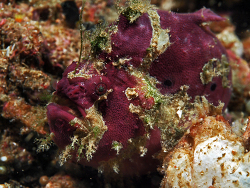 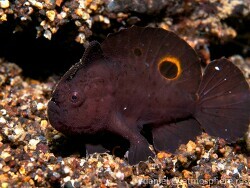 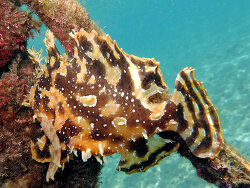 Frogfishes are widely distributed in tropical waters of all four major marine faunal realms of the world. 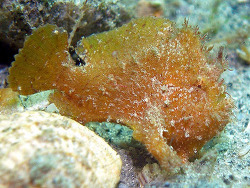 By far the majority of the species, however, and all but three of the genera, are confined geographically to the Indo-Australian Archipelago. 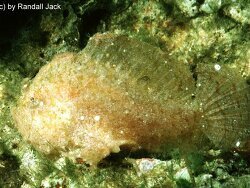 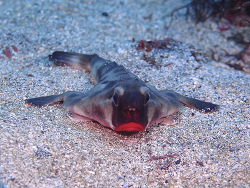 The family is well represented in the Gulfs of California and Mexico, the Red Sea, and the Persian Gulf, but like all antennarioids it is unknown from the Mediterranean Sea.